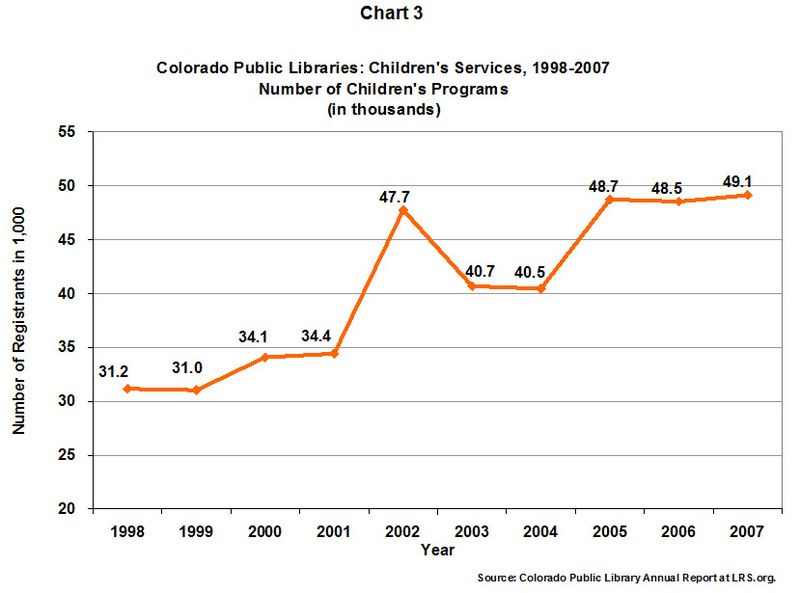 During the decade spanning 1998 and 2007, circulation of public library children’s materials and participation in public library programs for children increased significantly both in Colorado and in the United States. While Colorado statistics for these measures grew in fits and starts over the 10-year timeframe, the national numbers show relatively steady growth from one year to the next. This report provides a detailed look at the Colorado and U.S. data, as well as its correlation to the population growth rate of each locale. The number of circulation transactions for children’s materials rose 41 percent from 13.5 to 19.1 million. Attendance at children’s programs increased 53 percent, going from some 810,000 to 1.24 million. The number of children’s programs showed the highest rate of increase at 58 percent, going from 31,165 to 49,136 programs annually. Children’s circulation transactions totaled some 159.1 million and children’s program attendance totaled 10.2 million. From 1998 to 2007, the number of circulation transactions for children’s materials at Colorado public libraries rose from 13.5 million in 1998 to 19.1 in 2007, an impressive 41 percent increase. Most years showed either an increase or a slight decline. However, in 2002, children’s circulation transactions experienced an 11 percent dip and remained below 2001 numbers until 20041 (see Chart 1). 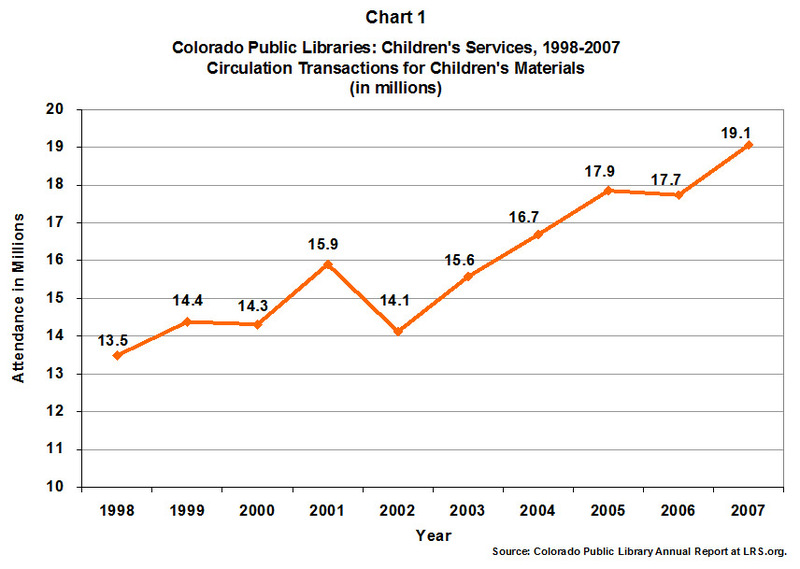 In total, over the decade, children’s circulation transactions at Colorado public libraries totaled some 159.1 million. Summer reading continues to be an annual favorite in public libraries. For more about children’s summer reading programs, see Colorado Summer Reading Programs More Popular Than Ever (Fast Facts No. 263, September 3, 2008). In the last ten years, Colorado experienced a 77% increase in summer reading registrants. In 2007, 97% of the state’s public libraries had a summer reading program. 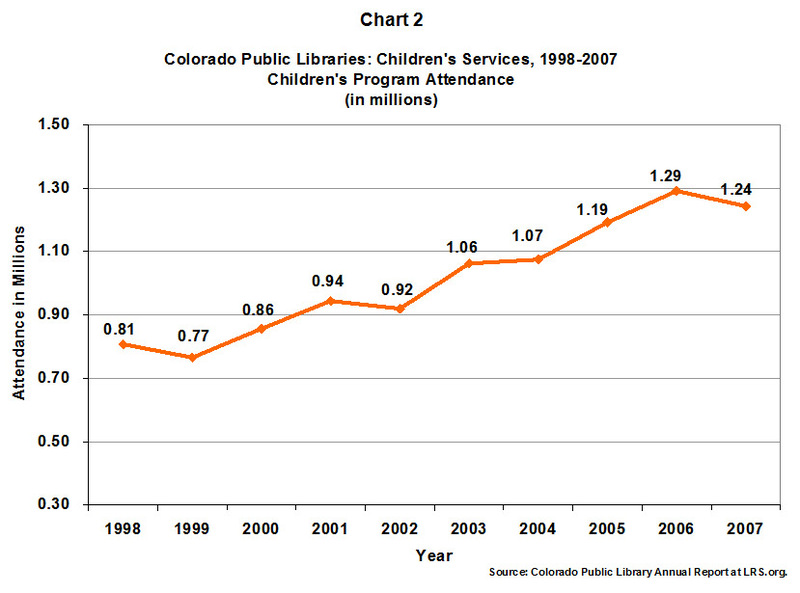 Annual children’s program attendance at Colorado public libraries ranged from some 810,000 in 1998 to 1.29 million in 2006. Despite a slight downturn in 2007, these figures showed a healthy increase of 53 percent from 1998 through 2007. While dips of 5 percent or less occurred in 1999, 2002, and 2007, over the decade, this measure trended mostly upward (see Chart 2). During these ten years, children’s program attendance at Colorado public libraries totaled some 10.2 million. The number of children’s programs offered at Colorado public libraries over the last decade—31,165 programs in 1998 compared to 49,136 programs in 2007—showed the highest rate of increase at 58 percent. Chart 3 also depicts the most dramatic hills and valleys of any year-to-year range in this report. Between 2001 and 2002, program numbers jumped by 39 percent and then declined by 15 percent over the next two years. In 2005 program numbers surpassed the 2002 level and have remained above that mark ever since. Over the past decade, the number of children’s programs offered at Colorado public libraries totaled more than 406,000. 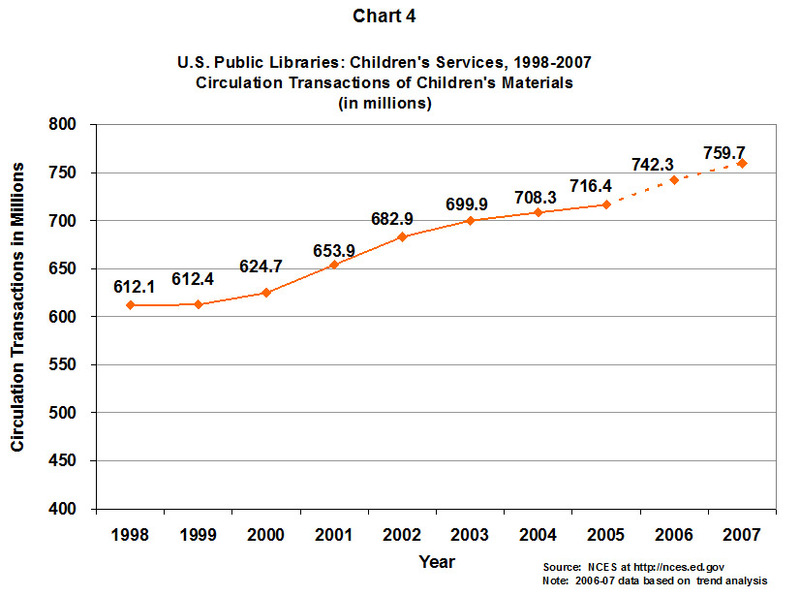 Children’s circulation transactions at U.S. public libraries totaled an estimated 6.8 billion for the ten year period. 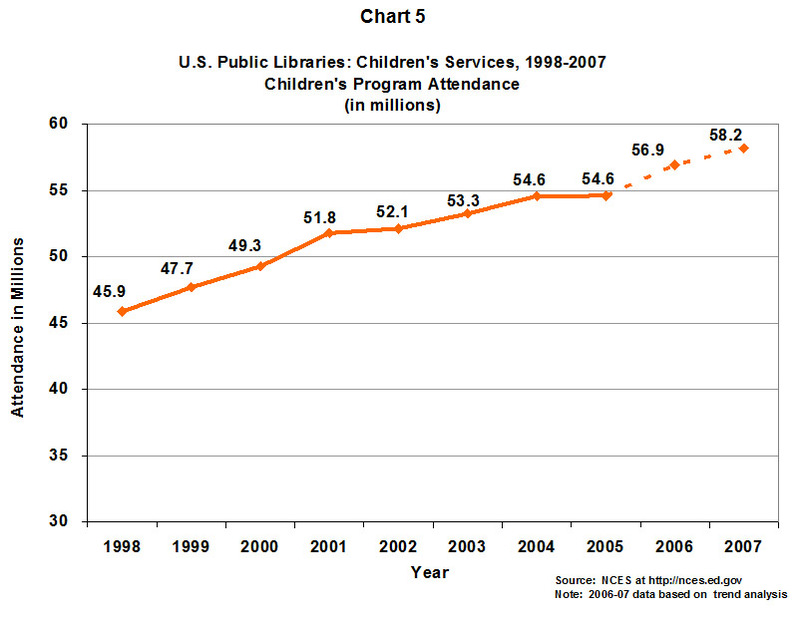 Between 1998 and 2007,4 annual children’s program attendance at U.S. public libraries grew from approximately 45.9 million to 58.2 million. Using the 1998 data as a baseline, attendance numbers rose steadily—reflecting an overall increase of 27 percent over the decade (see Chart 5). Over these ten years, children’s program attendance at U.S. public libraries totaled an estimated 524 million. According to U.S. Census figures,5 Colorado’s population grew 22 percent between 1998 and 2007. Increases in Colorado public library children’s circulation, program attendance, and program numbers all exceed the state’s gain in population growth. Likewise, on the national level children’s circulation and program attendance figures over the decade show greater gains than did the total U.S. population growth of 12 percent for those years. How do these rates of increase compare with one another? When correlated through the population-growth lens, the increase in U.S. children’s circulation transaction numbers over the decade outpaces that same measure for Colorado; conversely, the increase in Colorado children’s program attendance numbers exceeds that of the U.S. as a whole. The number of children’s programs cannot be compared because there is no public reporting of the annual national figures. The use of public library resources and services by children has been on the rise both in Colorado and in the U.S. as a whole over the past 10 years. Clearly, public libraries are collecting materials that children wish to borrow while providing appealing programs. Trends should continue to be monitored in order to understand how children’s public library use is faring in a world with ever-increasing ways to access and obtain information.